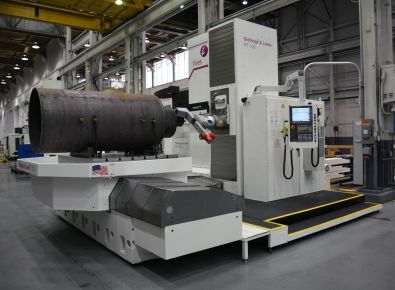 The Giddings & Lewis T-bed horizontal boring mill, introduced last year at IMTS 2016, is now available with a range of contouring heads and programmable boring bars also known as feedout tools. 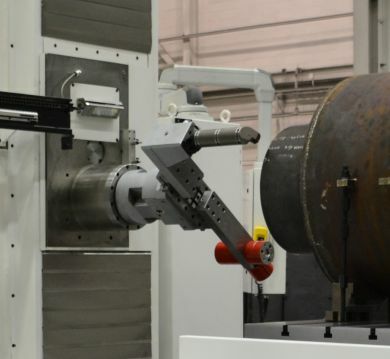 Feedout tools add an extra level of machining versatility to live spindle horizontal boring mills. Providing a programmable axis capable of turning and complex machining operations, contouring heads and programmable boring bars improve quality and decrease cycle time and manufacturing costs by reducing the number tools and setups required. Because they are a programmable axis, feedout tools are able to machine part features of varying sizes with a single tool. The live spindle Z-axis motion moves the attachment cross slide providing radial feed to the tool. Bores, tapers, grooves, chamfers, phonographic finishes and recesses of differing sizes are just some of the operations possible with a single tool. Giddings & Lewis T-bed boring mills are available with contouring heads able to produce bores from 0 to 1250 mm (0 to 49.2 in) in diameter. The cutting range of the programmable boring bars is 150 to 580 mm (5.9 to 22.8 in) depending on the bar size. The ability to do turning operations without the need to move the part to a lathe improves part quality by reducing the potential for errors. The U.S.-built Giddings & Lewis T-bed boring mill, with rigid cast iron construction and extreme accuracy, was designed and priced with job shops in mind. Engineered for flat-floor installation, small footprint and low ceiling clearance, the boring mill is configured with a 10,000-kg capacity (22,000 lb) 1250 x 1400 mm (49.2 x 55.1 in) contouring rotary table. The 130 or 155 mm (5.1 or 6.1 in) gear-driven spindles are available with drives up to 45 kW (60 hp) and 3380 Nm (2493 ft lb) of torque.